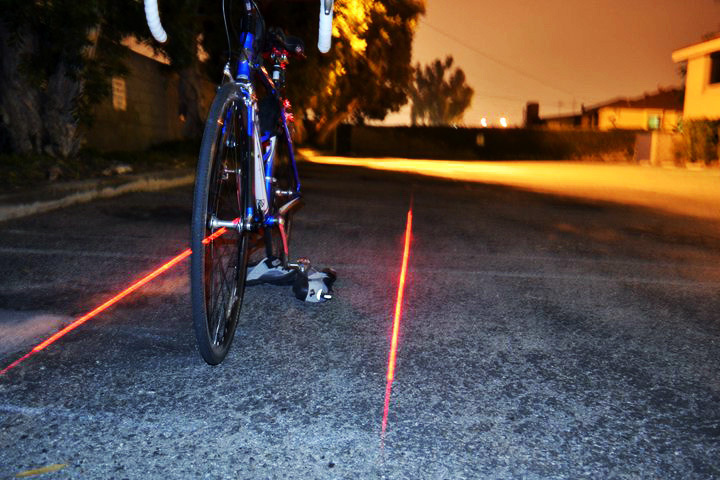 The XFire Safety Light Lets You Take Your Bike Lane With You | OhGizmo! Sharing the road is important, not only with other motorists but with cyclists as well. Not every street has a dedicated bike path and it can sometimes be hard to know just how much space to give the two-wheeled commuters when passing beside them. The XFire taillight has lasers that project two parallel lines on the ground, clearly marking out the space needed to remain safe and comfortable. There’s also 5 strong LEDs at the back so that not only your portable bike path is visible, but the bike itself in the middle of it. At $37, it’s a relatively inexpensive way to add a layer of safety to any after-dark bike ride.